Summer Foods or Fall Foods? Here’s the deal. I know that fall is coming but it is one entire month from now. As a result a lot of bloggers are already gungho gaga over pumpkin. They get more nuts over pumpkin than they do fresh garden tomatoes and in my opinion, there is simply no comparison especially since the pumpkin in question is in a can. To create a similarity I would have to be heralding cans of diced tomatoes in April; months before the real deal was available on the vine. There are definitely two camps. The ‘I shall shout PUMPKIN’ from the rooftops camp and the ‘Oh enough of the pumpkin already, it’s still August’ camp. Any doubt which one I’m in? If it wasn’t clear then this month’s lineup for Progressive Eats should answer that question. Stone Fruits. They of the peach, plum, apricot, nectarine and cherry variety. Summer all day long fruits. So perfect. Actually a theme picked by my friend Ansh but without any prodding from me at all; I promise! That could be said of stone fruits too. Never much sense for me to buy them from Mexico or other far reaching places…if they’re not local they all to often never ripen well and are such a disappointment. But when they are fresh and good? Well, they are very, very good and I can’t get enough of them. I have on occasion been so eager I’ve been happy to haunch over the kitchen sink to enjoy a juicy ripe peach and let the juices dribble where they may and that might just include my shirt; ahh…see why the FedEx guy always eyes me suspiciously? Or he knows I’ve been eating a Colorado peach. Still, that is one version of nirvana. Another might be having any one of them in a baked good. Baking them brings out even more of their inherent sweetness, softens the fruit and combined with a pastry of some sort can make for results that are simply irresistible. And irresistible is certainly what I was going for while heralding the last days of this glorious summer fruit. While Georgia is often thought of as the Peach State, I would put up our Colorado peaches from the Western Slope in a heartbreat as a worthy rival. Grown on the western side of the Rocky Mountains, the warm days and cool nights make for amazing peaches. That coolness at night elevates the sugars and they are sweet and juicy and honestly ruin any other peach for me. Give me Olathe or give me death!! OK, maybe a bit dramatic but please do give me Olathe peaches. This month I wanted to try something new. I’ve always loved Pineapple Upside Down Cake but have heard mention of Peach Upside Down Cake and thought it would be the perfect time to give it a try. I had the peaches, I had some recipe ideas and since I had also been gifted with a local bourbon I thought it would be the perfect addition. 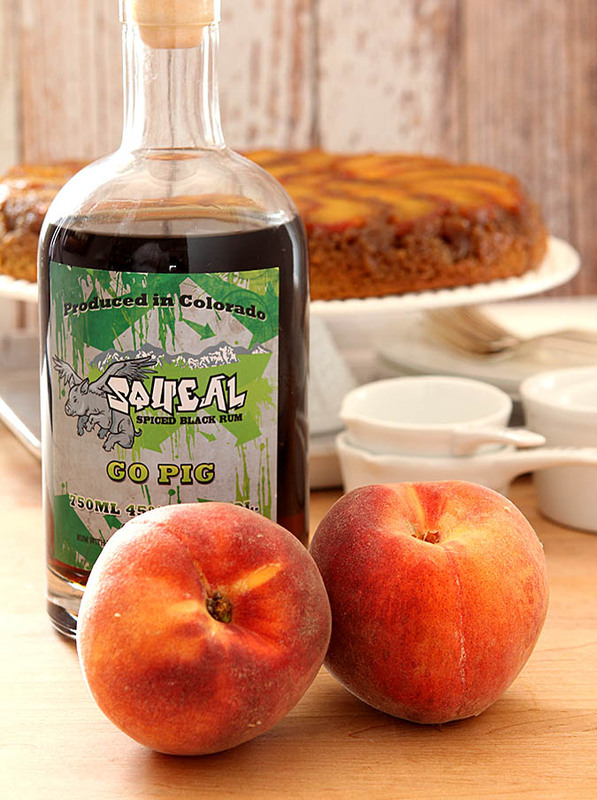 A friend of mine works for a company called Experience Pros and one of their clients is the brains behind Squeal Go Pig Black Spiced Rum. Or just Squeal Black Rum. She secured a bottle for me to try and there it was; right there in front of me on the kitchen counter, just crying to be included in my ‘all Colorado’ cake. Done. And done well. For such a young bourbon and especially one from Colorado it has won a number of awards but what sold me? Another reviewer said, “On the palate it’s sweet but not overwhelming. Fruit jam hits the palate first — plums and cooked peaches.” Peaches? See it was meant to be. I did give Georgia a nod with some pecans sent to me from a friend but it’s that combination of peaches and rum that made this cake a standout summer treat. Make sure you check out the list of Stone Fruit recipes from my friends in Progressive Eats that listed after the recipe. Won’t you join me and celebrate SUMMER?!! Preheat the oven to 375 degrees F. Combine the butter and brown sugar in a 10" ovenproof skillet and stir until the mixture looks like wet sand. Add the vanilla and bourbon and cook over medium-high heat until it starts to bubble. Remove from the heat and arrange the peaches in concentric circles over the caramel and set the skillet aside. Beat the butter and the remaining 1 cup sugar in a large bowl with a mixer on medium-high speed until light and fluffy, about 3 minutes. Add the eggs one at a time, beating after each addition, then beat in the vanilla and bourbon. Whisk the flour, ground pecans, baking powder, baking soda and salt in a bowl. Reduce the mixer speed to low; add the flour mixture in 3 batches, alternating with the buttermilk, beginning and ending with the flour, and mix until just incorporated. Pour the batter over the peaches and spread evenly. I did not peel my peaches; first I hate peeling peaches but I also thought the color of the skin might make it be pretty and I was right! ? 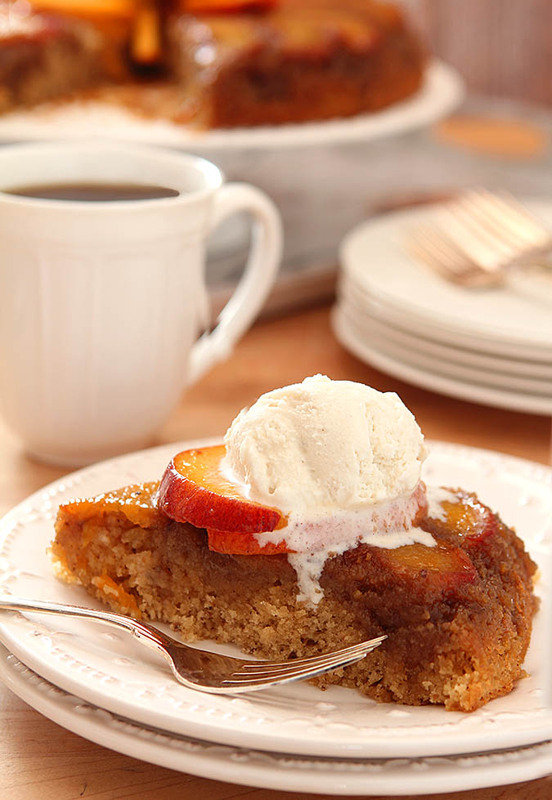 When slicing the peaches and making sections that fit into the skillet, there are ends that are too small so I saved all of those pieces; probably 4 slices per peach and added a couple of tablespoons of brown sugar to them and let them macerate while the cake cooked. Once ready to serve I used those peaches as a fresh component on top of the cake and I loved the layers of cake, fresh peaches and vanilla ice cream. It's optional but good! I am allergic to pecans. Can I substitute? Sure, use any nut you like, you can also make it without any nuts at all. I’m in no hurry for summer to come to a end! It means cold weather is just around the bend, and I despise cold weather. 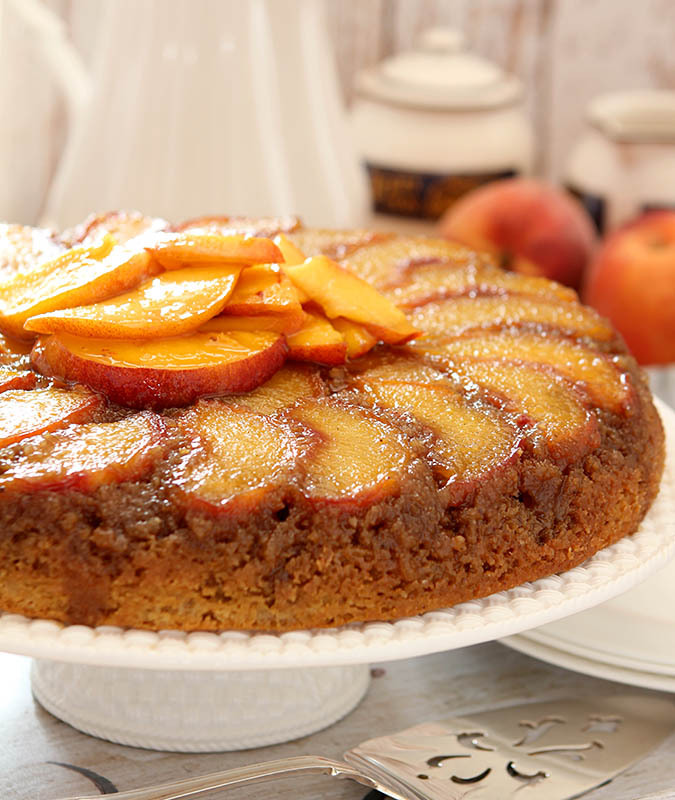 For now, I’ll keep enjoying the fruits of summer including this luscious upside down cake! Does the cake have to baked in a cast iron skillet? Plan on making it for the weekend, looks delicious! No, as long as your skillet is large enough to hold the mixture it won’t matter. I’m an autumn kinda girl all the way, but I’m never in a hurry to say goodbye to summer tomatoes, peaches, corn, etc! This cake sounds amazing, just the type I love…nothing too fancy, no frosting – just flavor! I’m so intrigued by that alcohol…I love the label. Is it bourbon or is it rum, though? Either way, you cannot beat local! It’s a bourbon…which of course is sacrilege to anyone from Kentucky but it’s done well and it was fun using something local. Make BUY Local! a reality. What a stunning cake – I am savoring every last piece of summer fruit I can get my hands on. Love this! Me too Jeanette. This time of year I’m a vegetarian…only because I’m happy to eat my fill of fruits and veggies; meat can wait! I’m not ready for fall food yet!! I’m still enjoying all the delicious summer fruits and veggies!! Thanks Liz and back at ya…I enjoy the challenge of making something according to a subject and really love seeing how creative everyone else is too. I haven’t made a hearty dessert like this in some time, I’ll be heading to the store to get some fresh peaches ASAP! You won’t be disappointed; it was really fantastic. That’s why I had to give most of it away! Amen sister! I asked the fellow at Sprouts when we would see pumpkins…not for several weeks yet. I HAVE to find a Cinderella pumpkin…there’s a project for us. We could make a sweet and a savory dish and freeze a whole bunch for the rest of the year! What a wonderful spin on the traditional pineapple upside down cake Barb! I love peaches in anything, but when you combine them with sugar and a splash (or three) of booze – OK, you had me at Bourbon, LOL. This is absolutely beautiful and definitely in my to-make file! Something about that butter and sugar and caramelizing it with fruit that is a surefire winner isn’t it Jane. I just bought a pineapple last night…it’s next! I am squarely in the “it’s still summer” camp at least until about the third week in September. Even then, if it’s still hot here, my pumpkin-meter may still be at zero. 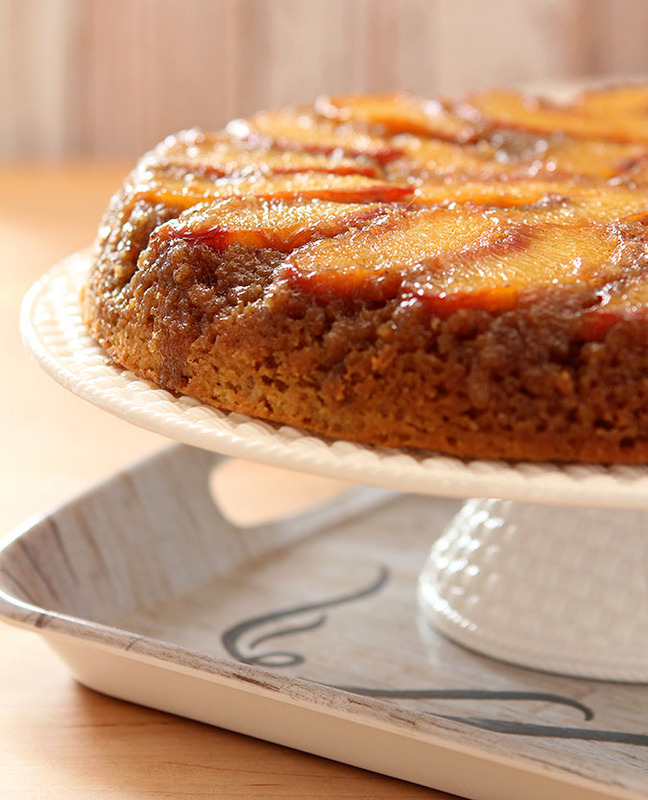 This cake in all its peachy Colorado glory is just perfect. Love it! Me too. The weather is a better predictor of my changing than anything else. Pumpkin is for cool weather. Peaches are for now! Way too early for pumpkin recipes! Sure, you might want to give a nod to the changing of the seasons (back to school, Labor Day, all of that), but there are far better ways to do it. No pumpkin recipes before October, IMO. Maybe the last week of September, but even that’s pushing it. Anyway, love the combo of peaches and bourbon. This is inspired — thanks. That does it! You will definitely find me on your doorstep next Colorado peach season with plate and fork in hand! This is one exquisite upside down cake!!! Watch…I’ll hold you to that! Thanks Liz; it was seriously good. Haha I love your pumpkin rant. And this cake — oooooh this cake! I need it.